High Efficiency Gas Furnaces--Save Money: How Do I Know When To Replace My Older Furnace? It can be a difficult decision when it comes to replacing your old furnace. A large expense is involved,and it needs good decision making. When you are deciding on whether or not to replace an older furnace the age and the working condition of the unit are the most important factors involved. Furnaces which are fuelled by natural gas or oil frequently last for some 15 to 20 years, when they have been properly maintained. Heat exchangers in older furnaces are less efficient than those in new machines, and produce less usable heat from the fuel they burn. Fan motors are of single speed construction, and are therefore considerably less efficient then the state of the art motors in new furnaces. The old furnace may not have been well maintained, or air filters serviced regularly. This shortens the useful life of the furnace, and necessitates earlier replacement. It is very wise to have your furnace serviced every year, and to routinely inspect and replace air filters which are dirty. Many old furnaces were oversize for the home they were installed in. Fuel was dirt cheap years ago and efficiency was the last thing people thought about. The correct sizing for your new furnace should be worked out by an experienced installer, and will very often be smaller than the size of the old unit. Less fuel will be consumed because of its smaller size, and also due to the fact that it has a very much better efficiency rating (AFUE). Furnaces manufactured 20 years ago or earlier are commonly about 60% efficient or even less. The new high efficiency furnaces of today have 90% to 97% AFUE ratings, and consume a lot less fuel to heat a home properly. Most high efficiency furnaces can be installed making use of the same ductwork the old furnace used. So there is no extra expense for new ducts. Exhaust gases are normally vented through a side wall of the home and the chimney is no longer needed. The exhaust gases are at a quite low temperature, and can be vented to the outside using plastic piping through a side wall. Fresh air to fuel the furnace is pulled in through plastic piping from outdoors also. Your new high efficiency gas furnace will dramatically cut your fuel bills, and this considerable saving will pay for the new furnace. The length of time needed till this payout takes place will depend on fuel consumption of the furnace. In cold climates more fuel is used to heat the home and the saving will be bigger than in warmer climates. 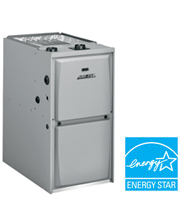 Over time you will get back the cost of the furnace from the fuel savings. The price of natural gas as with all fuels is likely to increase in the future which will make the savings even bigger. Knowing when to replace old furnaces can be tricky. Replacing the heating equipment in your home or business from time to time is a necessary evil of owning real estate.